British artist Alex Chinneck has unveiled an installation that sees an old Milanese building ripped open by giant zips. On show on Via Tortona for the duration of Milan design week, the installation sees one of the building's 17-metre-wide facades peeling back, and also creates openings in its interior walls and floor. Chinneck created the work for Iqos, the vaping and heated tobacco brand. He added a giant zip that seems to open the front of the building's right side to reveal a glowing light behind that fades between blue and bright white. "Through the repeated use of the zipper, we have opened up the fabric of a seemingly historic Milanese building to playfully reimagine what lies behind its facade, floors and walls," said Chinneck. Inside, a semi-circular hole in the floor has been unzipped so that the cement floor appears to peel back, emitting a bright white light from below. Chinneck excavated and re-poured the entire concrete floor in order to install the artwork. Another zip down the centre of an internal wall seems to drag the wall itself down and reveals a glowing light behind. "Ethereal light pours through each opening, filling the space with colour and filling the work with a sense of positivity and potential," said Chinneck. "By taking familiar materials and architectural forms and making them behave in extraordinary ways, we are working with Iqos to change visitors' perceptions of what is possible." The project is the artist's first in Italy. He came to prominence through a series of installations in London and the south-east of the UK, including Telling the Truth Through False Teeth, a project in which he fitted 312 identical broken window panes in an abandoned factory in London's Hackney. For London Design Festival four years ago, Chinneck planted an upside-down electricity pylon in a field near the financial district of Canary Wharf. He also unzipped a soon-to-be-demolished office building in Ashford, Kent last summer, near to where he had recently moved his studio. At the time he said that he "kept it playful" with the zipping element in his work – something he has sought to replicate in the exhibition in Milan. "We have designed a series of immersive experiences that present our material world in a new light. Familiarity is infused with fantasy as we playfully and literally stretch each visitor's perception of what is possible," said Chinneck. 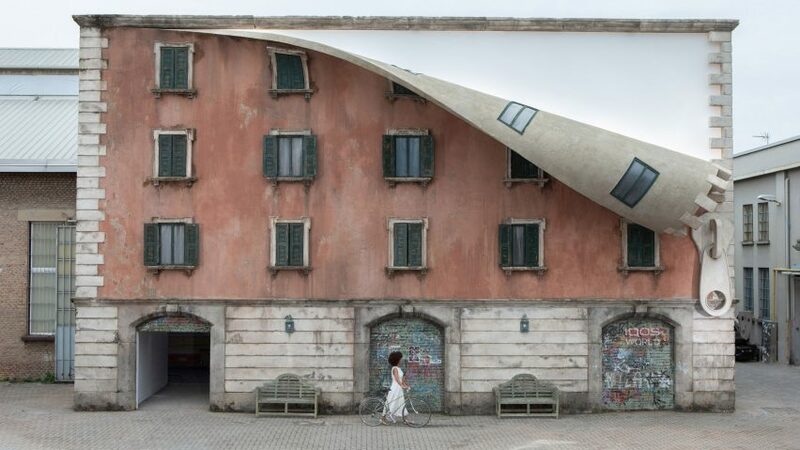 Alex Chinneck's installation is at Spazio Quattrocento, Via Tortona 31, Milan 20144 from 8 to 14 April.